ACTIVE M&A Experts advises its customers extensively with the acquisition of companies and equity. This includes the entire process from the analytical preparation to the search for enterprises, making contact, negotiation, due diligence, up to the conclusion of the contract. We take on the project management, coordination, but also sub-tasks as a consultant in the team. A corporate sale is for both, the family owned companies as well as for large corporate groups one of the most important business decisions. 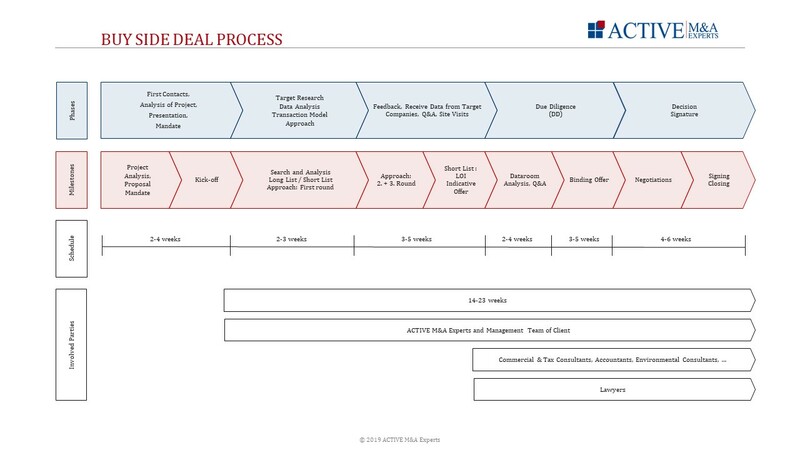 ACTIVE M&A Experts supports their customers from the first idea to the final implementation of a transaction. It is our goal to achieve an optimal sales result for our clients and their companies. ACTIVE M&A Experts assists its clients during the entire search, selection and transaction processes. We can, due to our detailed knowledge of financial investors establish the personal contact to the appropriate funding partners. A merger or joint venture of companies requires a clear definition, but also a fair balance of interests. Due to the long-standing leadership activities in the operational business we are very familiar with the organization and leadership of joint venture companies. 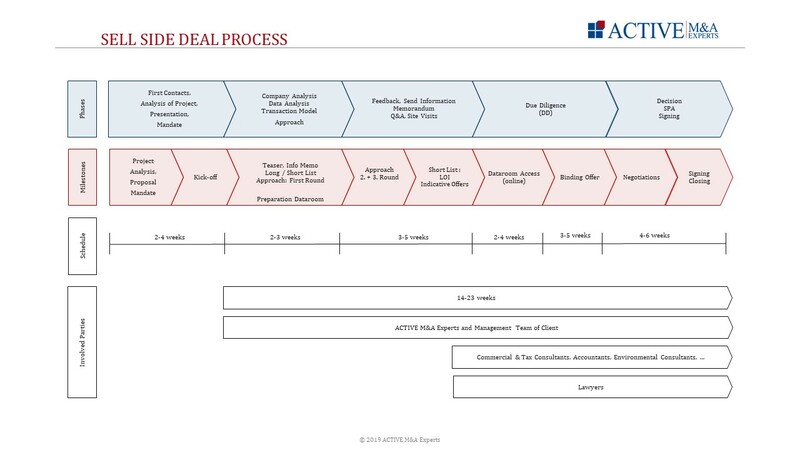 ACTIVE M&A Experts supports the joint venture partner in the structuring process, from the analysis of the contents of the structure until the conclusion of the contract. In the M&A market, there is a strong internationalization. Today hardly any transaction is exclusively limited to Germany. For this reason, in the case buying or selling, a powerful cross-border network with international contacts and know how is of decisive importance. ACTIVE M&A Experts has a perfectly functioning and successful worldwide network with M&A Worldwide – The Network for Mergers & Acquisitions. The thorough preparation of a transaction is crucial for the successful execution and an optimal result. This includes both the transparent representation of the key figures from the past and the present, as well as a clear overview of the future opportunities for development and their implementation. ACTIVE M&A assists you with the transaction preparation analyses and in the services, which are useful in the actual transaction process. For special tasks we are in constant contact with the appropriate experts in the special fields of law, taxes, financing, management, environment, etc. Successful Sell and Buy Side Transactions require well-structured processes.